A few years’ ago, I did a one-day crash course in baking all things French and croissant related at the wonderful Handmade Bakery in Slaithwaite. It was a lot of fun, and the batch of croissants I came away with were the best I’ve ever managed, mainly because of the expert guidance on hand to provide a gentle and encouraging nudge back on course when my dough laminations started to go slightly off track. For lunch, we were given pulla breads, a type of sweet pastry from Finland that’s reminiscent of a brioche, and I’ve mimicked that recipe very successfully. 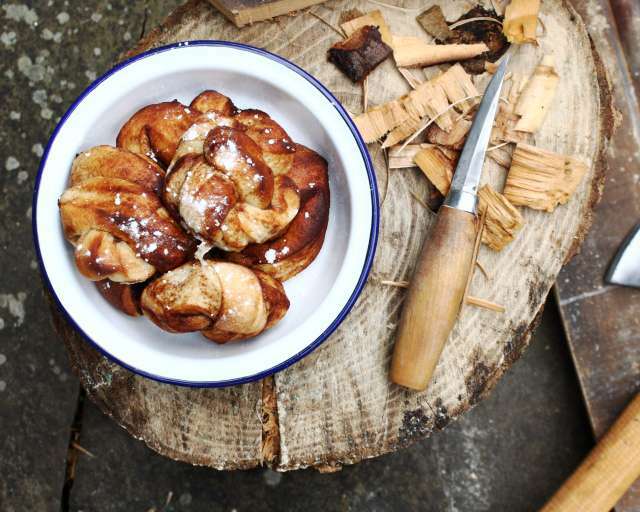 These Swedish cinnamon rolls are another riff on the central idea of a rich, sweet dough, folded back on itself to enclose a filling. It’s a technique that’s simple and easy, a world away from the more precise and regimented discipline required to turn out a batch of croissants worthy of the name. These rolls are very common in Sweden, and with good reason. They’re excellent heated through gently and served warm with coffee, especially if the day is cold and damp. Start with 500g of strong white flour, and add 10g of salt, 15g of instant yeast, 100g of melted butter, 75g of caster sugar, a teaspoon of ground cardamom, a medium egg and 260ml of lukewarm milk, mixing everything together to form a dough. Knead the dough for fifteen minutes. Use a mixer with a dough hook, or do it by hand. The method matters not, but I sometimes like to knead by hand, to feel the dough come alive in my hands, turning from a ragged slurry into a silken dough, shining and supple. Cover the bowl with some clingfilm or a plastic bag and let the dough rise for forty-five minutes, or until it’s doubled in size. It may take longer. When the dough has risen, knock it back and let it rise again for another half an hour. This helps to develop the gluten and makes the dough more elastic. Better bread. Next, tip the dough out onto a lightly floured work surface and stretch, flatten and pull it into a square. Roll it out into a bigger square, about 45cm on each side. Now for the filling. Mix together 50g of soft light brown sugar and 10g of ground cinnamon. Gently brush or spray the dough with water – don’t over wet – and sprinkle the filling over one half of the square. Lift the other, clean side back over the filling so that you’re left with a rectangle of dough, the filling sandwiched in the middle. Now, a choice. For really big rolls, slice the dough into 2.5cm strips, for smaller rolls, cut each of those strips in half, to make two pieces each about 12 or 13cm. I make some of each size. Take each strip of dough and stretch it carefully, twisting it around, each hand working in opposite directions, then tie each twisted piece together into a knot. The result is a messy lump of dough, the filling peeking out, the dough twisting and turning in all directions. Lay the rolls out on a baking tray and let them rise again for at least forty-five minutes, maybe longer, before brushing with beaten egg and baking in the oven at 190c for about fifteen minutes for big rolls, ten minutes for smaller ones. Keep a sharp eye out after about seven minutes, and watch for over-browning. This recipe is from Dean Brettschneider’s excellent book, Bread. This is an accessible and authoritative book on the subject of bread making, and an invaluable resource in many of my bread-related experiments.